Time: 7:00-7:45pm – Interview featuring guest artist KATHERINE CLAPNER, head chef and owner of Dude, Sweet Chocolate…followed by the movie CHOCOLAT! Since beginning her culinary career as Pastry Chef at Sam’s Café in Dallas; following a graduation from the CIA in NYC; Clapner has extended her training internationally and gained many years of valuable experience at notable establishments worldwide. She has worked under the tutelage of recognized names such as Chef Charlie Trotter and Chef Kevin Graham, and has trained and held Pastry Chef positions at Charlie Trotter’s (Chicago), The Windsor Court Hotel (New Orleans), Hotel Cipriani (Venice, Italy), The Savoy Hotel (London, England), and in Austin, Texas, at Mansion at Judges Hill and Ranch 616. 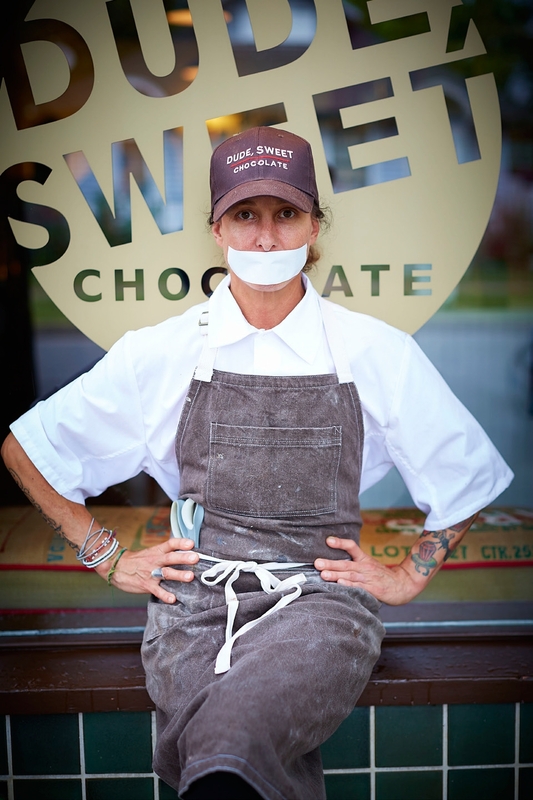 Her final collaboration, as Executive Pastry Chef for Stephan Pyles, resulted in her current incarnation as the brain-trust behind Dude, Sweet Chocolate. The opening of the flagship store in Bishops Arts District in Dallas has propelled the brand to local cult status, which has hit the national radar screen as of late. The Cooking Channel recently filmed at the store, capturing the joie de vivre of Katherine and Dude, Sweet on the Food Networks sister station, and NBC national has found Dude, Sweet to be of interest for several spots, creating a national buzz that the ecommerce site is striving to keep up with. Local accolades and worldwide attention continues, with five years running as D Magazine Best Of, and a recent trip to Italy to attend the SIPEG show courtesy of the Italian Trade Group. The Dude Sweet family currently maintains a full time production facility, as well as three retail shops; Bishop Arts, Greenville Avenue, and Fort Worth.